We're talking with John Dingell's sone about what he says is his father's greatest accomplishment. DETROIT (WXYZ) — The nation is mourning the loss of Congressman John Dingell, who is responsible for acts that shaped America and impacted every single citizen's life. The clean air act, clean water act, civil rights act, voting rights act are just a few pieces of historic legislation he was part of. But his son Judge Christopher Dingell says one accomplishment in particular was personal. “My dad had a sister that died when he was two-years-old. It is the kind of ailment that would be easily treatable today, but this was the Great Depression,” said Judge Christopher Dingell. He explains that his dad’s family was forever changed by the loss his parents never completely moved on from. As a result, John Dingell’s dad, who was also a congressman, advocated for health care access until he passed in 1955. When his son ran and replaced him he continued the fight, determined to make sure no other family suffered like his did because of poverty blocking access to healthcare. John Dingell is often seen in pictures holding a gavel. It is the gavel he used in 1965 when Congress created Medicaid and Medicare, guaranteeing health insurance as a right to every American citizen over age 65 and the poor. He was also behind the affordable care act. 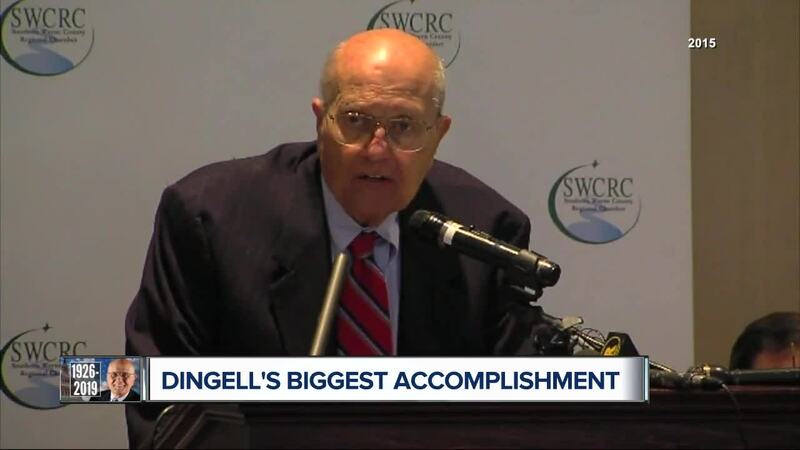 “No person should die for want of health care,” said Dingell when he spoke about his accomplishments as he retired in 2015. “His proudest achievement was healthcare, to greatly expand healthcare for Americans,” said his son. “Over the years we'd create the National Institutes of Health, the Children's Health Insurance Program, & many other efforts to improve care,” said John Dingell in one of a series of tweets sent out in 2017 as he told the story of his part in improving healthcare access in America. The following tweets spoke about how the affordable care act lowered rates and provided millions of people with coverage they never had before.